When Liverpool signed Mohamed Salah for approximately £40m, the immediate reaction of many versed in football analytics was that the deal seemed a bargain. Why? TransferLab is based on a complex expected goals model that rewards or penalises every action on a football pitch based on its effect on the team’s likelihood of scoring. The Value displayed for each metric, if it has ‘xG’ in it, is a player’s xG added or detracted through that action per 90 minutes. ‘xP rating’ is the ratio between actual passes completed and expected passes completed based on their difficulty. The percentiles are calculated relative to other players in the same position. Salah was getting more chances than almost all players within his position. Many football statistics have distributions far from normal, so a density visualisation can help us process this. Liverpool’s system is uniquely good at creating chances for its wide players, largely because of Roberto Firmino’s brilliance at bringing other attackers into play. Like Karim Benzema at Real Madrid, Firmino is a facilitating striker: the xG he adds per 90 from passes into the box, key passes, and short passes, is higher than almost every player in his position. 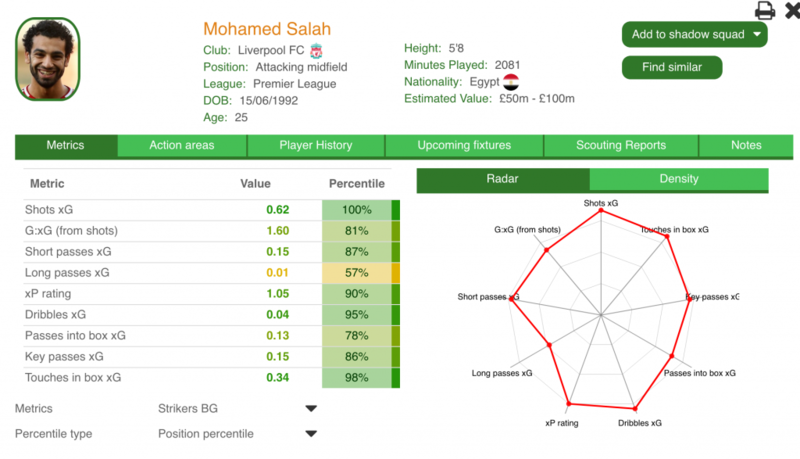 This made Anfield a fantastic prospective home for Salah (naturally, this is an easier claim to make in hindsight). 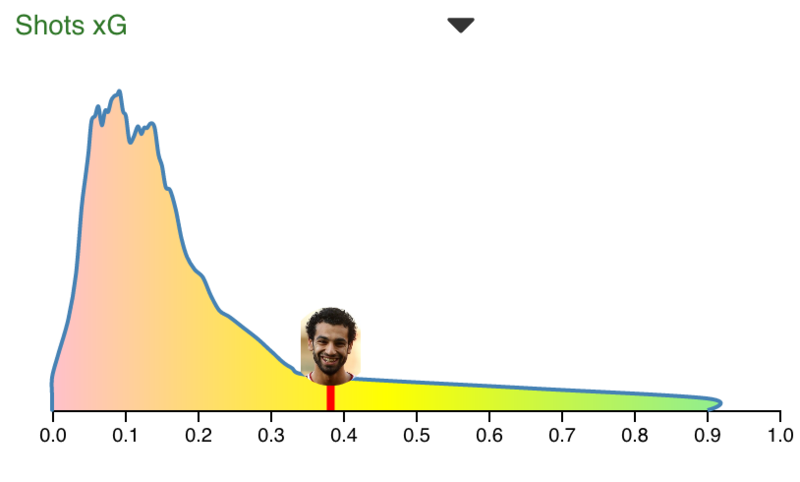 As a result, Salah’s output has sky-rocketed into the stratosphere. 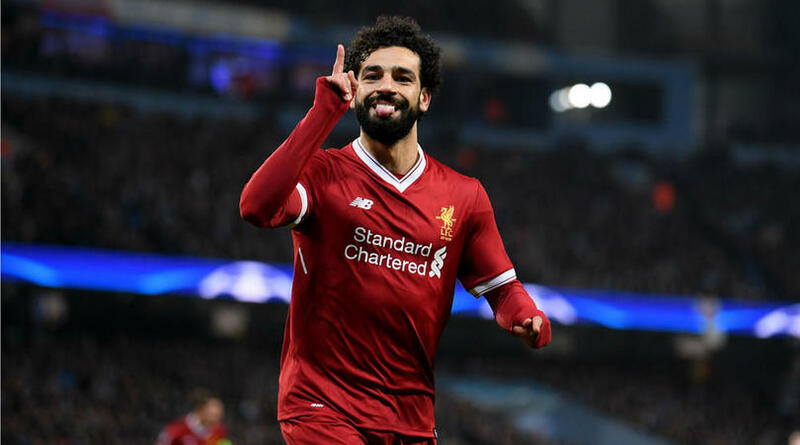 He gets better chances than anyone in his position, and has been taking them ruthlessly (his G:xG ratio, which is known to be streaky from season to season, may very well drop a bit next campaign). He has even started dribbling more, creating chances for himself as well as getting them. The touches he takes in the box are ruthlessly efficient. In short, the transfer was perfect: a combination of systemic suitability and value. Because of his perceived ‘failure’ at Chelsea, the Premier League was taken by surprise. Analytics FC provides software and data services to entities within football looking to realise the gains possible from analytical thinking. Through a product development collaboration with Lane Clark and Peacock LLP, we provide cutting-edge software solutions such as TransferLab, which helps improve and simplify recruitment decisions. To find out more about TransferLab, or to find out more about us, get in touch.